That’s what little boys are made of, apparently. Not a very nice rhyme, when you come to think of it – though also rather a confused one. I mean, puppy dogs’ tails are nice things, aren’t they? All waggy and cheerful. And snails can be quite pretty when you look at them, and very tasty with a bit of butter and garlic. Slugs – okay, there’s not a lot to be said for slugs. Sorry. What’s this got to do with anything, I hear you ask. Well, as I may have mentioned in passing, this week was my first week back in work since taking unpaid leave at the start of July. A degree of excitement at the change got me through Monday, but by the end of Tuesday I was a miserable wretch, unsure how – or indeed if – I was going to make it to the end of the week. Some time on Wednesday something clicked back into place. I don’t know how it happened, but it did. One minute I was bewildered and miserable and ready to beg The Husband to sell up and move to the Orkneys and keep goats; the next it all seemed – well, fine. The job was new, yes, and frantically busy, and I didn’t know what I was doing – but it all felt manageable. I knew I’d learn what I needed to. I believed I could be useful. I felt – dear God, I can hardly bring myself to write it – I felt like a civil servant again. And that made me think – what is it that makes us think of ourselves as one thing or another? Is the need to define ourselves innate to our nature, starting even before those rhymes that tell us we’re made either of molluscs or cooking ingredients? And if that’s the case, what happens somewhere along the line that makes some of us feel we want to claim the badge of “writer”? I’ve seen enough posts about this topic to know that the question of whether or not we deserve to call ourselves writers is something that exercises many of us. Do we qualify before we’ve had something published? Does self-publishing count? What about pieces in magazines? Is it something about sales? The obvious question in response to all this soul searching is, why does it matter? The somewhat circular answer seems to me that it matters because we want it so much. We want our efforts recognised. Somehow, being able to call ourselves writers legitimises the hours hunched over a keyboard or notepad; the solitary, often painful process of choosing, arranging and rearranging words that, for the vast majority of us, will only be read by a handful of sympathetic friends and family – and that only if we can steel ourselves to expose our souls and share our writing with anyone at all. It’s behaviour that could almost be a definition of madness – but give yourself the label of “writer” and it’s suddenly reasonable, admirable even. You are one of a tribe: a creative. An artist. She then goes on to explain what this requires, which seems to amount to writing in a notebook at unsociable hours, using a thesaurus and reading (second-hand books, apparently, which as we all know are morally superior). For someone who claims to be “passionate” about plot structure, Ms McCain’s argument is a little difficult to follow. There’s something about caring about your work, being keen on punctuation, having churned out stuff for a long time and having a degree (goodness knows how all those eighteenth century writers managed to produce classic fiction without the aid of a Masters in Fine Arts). 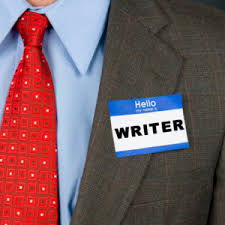 My issues center on those who lack substantial credibility and a modicum of talent – but still call themselves writers, still feel they can start from the top, so to speak. Unskilled self-published authors, brain-dead bloggers, lifelong townies who are given a literary soapbox: If it wasn’t for technology, you probably wouldn’t have a page to write on. Here’s someone who’s stamping her little foot because writers like E.L. James can publish work that isn’t going to win any literary laurels, but – gasp! – people nevertheless want to read it. And she’s made a packet doing it! It’s just not fair! There’s poor old Rachel, on her second writing degree, and former deputy editor, no less, of Home Town Media Group (a “small community newspaper company in New York”), scribbling away for over a decade and still working on that manuscript (it’ll be ready any day now, I’m sure) – and NO-ONE CARES! No-one’s given her a badge to say how wonderful she is! No medal of honour to distinguish her from this dreadful woman who’s just come along and written a few books millions of people have enjoyed reading! The world’s gone to hell in a hand basket. Hmm, I smell something a bit pungent here. It must be the odour from that veritable vineyard of sour grapes. Well, here’s one nonchalant, brain-dead blogger who’s about to upset Ms McCain and others of her ilk. Yes, I’m a civil servant. And you know what? I’m a writer too. And you can stick that up your MFA. This entry was posted in Uncategorized and tagged blogging, real writers, writing on 09/03/2014 by yakinamac.